My Father started working at the post office in 1971. I began working there in 1988. Before I began to work at Canada Post my children were very young. Father and I would often go out shopping about town with his Grandchildren in tow. Of course, while combing through the streets and shops pushing around the baby buggies, we never failed to meet up with his various friends and coworkers. What I didn’t quite understand was his comment that followed every time he introduced the Grandchildren to his friends. Eventually I took it upon myself to ask him what he meant by this strange statement. For the life of me I could not think of anything hard about becoming a Grandfather. The picture you see above is a photo of the postcard written by a good friend of mine from work. There were many people who were good and kind enough to write out encouraging and well wishing postcards to my Mother after she received her cancer diagnosis. Some messages are kept very simple. And some were very funny. The card you see above I found especially touching. Not only does he offer encouraging words to my Mother, he also refers very lovingly to his own. Never before have I known anyone who has written about their own Mother so fondly, tenderly, and with reverence. It warmed my heart the first time I read it. 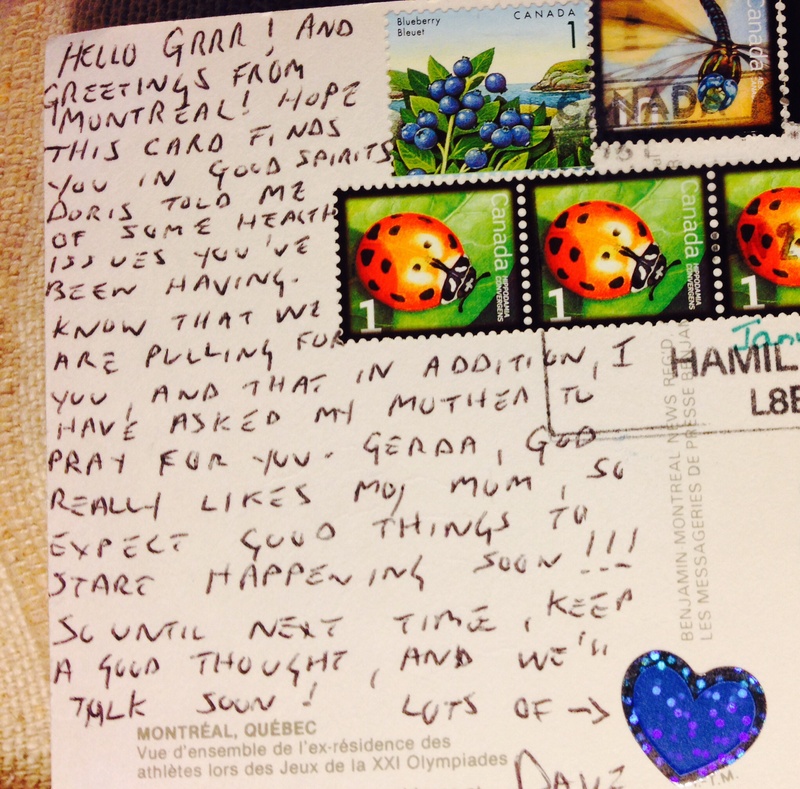 It warmed my heart when I received the postcard back right after losing Mother. And it still warms my heart as I reminisce about her. I hope this card finds you in good spirits. Doris told me of some health issues you’ve been having. Know that we are pulling for you, and that in addition I have asked my Mother to pray for you. Gerda, God really likes my Mom, so expect good things to start happening soon!!! So until next time, keep a good thought and we’ll talk soon! However, my Grandmother (Oma Scherer) loved postcards even more. She could not walk by a rack of postcards without picking out at least half a dozen. And almost every day of her long life, she seemed to find a rack of postcards somehow, somewhere. The vision of her with keen determination walking up to a cash register with a handful of a treasure trove of postcards will always stay with me. Several thousand would be a reasonable approximation. My grandmother was always a very busy and loving woman. I didn’t get to see her often, as she and my grandfather lived in Germany where he served as a Baptist minister. During her extended stays while visiting our house, she was helpful with the cooking and ironing. She was also very good at sniffing out cluttered drawers or closets. It was also a common scene to see her sitting at a kitchen table, writing amongst stacks of stationary, envelopes and rolls of stamps. “What are you doing?” as I came over to take a look at what she was up to. “I’m writing a letter,” she’d reply. “Greetings…” which was how she began each of her letters. Next to this word she would place lots of stickers showing floral bouquets. In those days they were not the self stick kind of stickers. You had to lick the back of them first. I can still remember there gluey tang. She had tons of them. “To who are you writing a letter?” I then asked her. “Someone who is in the hospital,” she’d say. Content with her reply, I leave her to her writing and go and play for a bit. Coming back a half-hour later, I’d still find her writing. “Is that the same letter?” I inquired. “To who?” I was a very nosey child. And so, this would go on all afternoon. By the time she was done, there was a stack of sealed envelopes addressed to points all over the world. Some were for overseas, some were going to the United States. I could not help but notice that the envelopes also abundantly well stickered. It was an enigma of sorts to me, a little girl, as to why she spent hours each day writing all those letters when there were other fun things to do like watch TV or play outside or in my grandmother’s case, cleaning out and organizing a closet. And of course there was the expense of it all, as she was forever purchasing more stationary, more stamps, and more booklets of those beautiful little flowery books of stickers. Still not satisfied I decided to press her further. Then she said something to me that I will never forget ever. And so, in September 2005 almost a year after my Grandmother passed away, I was visiting Mother when she handed me over a dozen very large and very full albums (or rather archives) filled with my Grandmother’s mementos and souvenirs that she had accumulated over the past eighty years. These archives include reams of journals, pictures, postcards, letters, newspaper and magazine clippings, pressed botanicals, paper napkins, swizzle sticks, matchbooks, records of expenses, speeches, sermons, prayers, songs, stamps, travel brochures, receipts, ledgers, telegrams, sugar packets, ticket stubs, menus, programs, cut-outs, notes, personal diaries, travel logs, photo albums, paper placemats, food wrappers, coasters, travel papers, money, invitations, military documents, and more. Some of the postcards were over one hundred years old. The question was obviously what was I going to do with them? I knew eventually I’d find a good use for them. It was just a matter of time until I figured out what it would be. The answer came to me six years later.